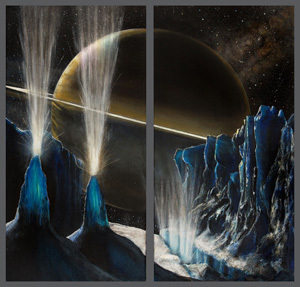 "I was inspired to paint this after imagining what an earth analog for the ice geysers on Enceladus would be. I started by looking at ice geysers associated with geothermal activity and quickly realized that the low gravity and lack of atmosphere on Saturn's moon would drastically change how these would develop over time. I visualized a kind of a ice geyser similar to the "Black Smokers" that can be found at the bottom of earths ocean, where ice builds up over time as it freezes while being ejected from the subsurface ocean. I took care to get Saturn correctly sized in the distance. From the surface of Enceladus Saturn would appear as 23 degrees across and the rings would extend out about 70 degrees. I did however use some artistic license with the ring inclination, as I wanted to show a bit more detail than the 0.019 would allow. In addition I adjusted the lighting a bit brighter as in reality it would be about 90 times darker in broad daylight there than on Earth. For the floor of the "Tiger Stripe" I envisioned a very new surface with a few boulders and lots of snow. Carolyn Porco suggested that there would be boulders on the canyon floors, but roughly 90% of the erupted stuff returns to the surface as "snow". The total predicted volume of material in the jets is approximately 50 kilograms (110 lbs) per second, over time this could cause quite an accumulation on the surface. I also included a faint E and a backlit G ring around Saturn. The Ice walls are purely hypothetical and certainly motivated by an aesthetic point of view."